First of all Gautama would like to explain his food patterns that he previously had before Nirahara Samyama. 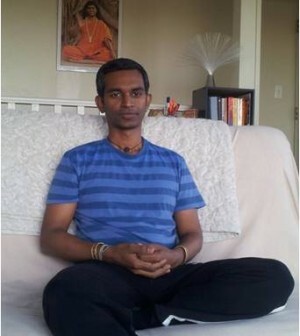 Gautamananda is a vegan by choice with a really big appetite and craving for any tasty food. Gautama liked to eat to fill his stomach and many times he would over eat. After food most times (if possible) Gautama would like to take a nap and this was his version of bliss 🙂 . If the food was of a spicy type (which most times were) he would eat something sweet after that – like chocolate or crystallized fruits. Snacking was also one of Gautama’s favorite pastimes . Gautama would work while having snacks beside him – vegetarian but unhealthy snacks with high content of sugar most times. This sort of gave Gautama a sense of satisfaction and ability to think better- at least that what he thought – almost like smoking and thinking. His favorite beverages are Tea with soy and jaggery which most times went well with his snacks. Not having food and being hungry would many times leave Gautama angry and frustrated which would sometimes lead to an unnecessary argument and a show of anger towards someone. Gautama first heard about Nirahara Samyama when he was at the ashram. Swamiji announced that there were few ashramites involved in this process called Nirahara Samyama – a meditation process of awakening the bio intelligence of getting your food source from Prana – life force from various sources including breath. During this time these ashramites will go purely on liquids mainly juices for the whole 40day period. On the 17th day being in the Ashram Swamiji announced that our facilitator for the program was one of them. Now this was really mind blowing as we see her all time 24/7 and we know she literally runs all day working and hardly has about 3-4hours sleep. The second mind boggling thing was Swamiji informed that she is a type two diabetic patient who constantly needs to have food and her diabetic tablets and she was on neither of them. This really was an eye opener to the validity to what Swamiji said he will do and clearly proved it without a doubt. To even further prove the concept medically, Swamiji had a doctor closely monitoring her progress. Many people were very inspired by this and by the next day some participants had already either drastically dropped their food intake or going only on juices. Gautama in the other hand was still trying to digest the whole idea of not eating. Swamiji warned although everyone else naturally being inspired in picking up not having food not to stop eating as they would were in a different process and were required to eat. Swamiji did announce that he will make it available to the mass once he has done more research on this with scientific backings. No doubt something was definitely happening in Gautama’s system as the whole idea was digesting, Gautama was far away from giving up food or even the idea of giving up food. When we got back home to Wellington, New Zealand after about a month, Swamiji announced that he was ready with the science for the mass and invited anyone interested to participate on a 2-way Video conference initiation into the Nirahara Samyama. 2-way video conferencing initiating people into meditation of no eating? That definitely sounded absurd but knowing Swamiji, he was not going to initiate something until he knows it was going to work. Nevertheless Gautama was still not convinced it was for him. The first batch – more than a 100 participants went through the 2-way Nirahara meditation without any issues. Many people were reporting feeling very light, without any hunger throughout the day. The rule and condition of the Nirahara Samyama was that the participant was to eat if they felt hungry. Swamiji stressed that it was no hunger meditation not a fasting meditation and that we were receiving food and energy during this process. We even heard of a group of people who mountain hiked from 3000 feet to over 5000 feet just to see how effective the Samyama was was. Gautama listened to a few testimonials from the first batch that completed successfully. They mentioned about how they had strong eating habits and how the meditation has brought a drastic change in their eating habits. Now this really started to stir something in Gautama , what if he could also possibly do this and drop his bad eating habits. The next batch of Nirahara Samyama, with a little persuasion from the wife, Gautama decided to try the Samyama. We started on Saturday and by the second day evening we felt hungry and started eating again. We were also unable to be on 2-way with Swamiji on weekdays as it was a working day during the meditation process. By the next batch Samyama we were determined to join in and somehow make some time of work to do the meditation. The first day was in a car using the free city wifi connection. That didn’t work so well for various reasons. Then we decided to take 1.5hours off from the office everyday to go back home and join in the 2-way meditation. This time first two days went away with no problem. As soon as meditation was over every day we would be full of energy with the stomach settling down with no sign of hunger. This was very surprising for Gautama as never he thought that this would happen for him. We had two days break and in that two days we started eating again all our favorite food. Next was the 7day process, so every day we would leave the office at about about 2:30pm , shoot back home(about 15mins) and attend the meditation then rush back to work. The 7 days went by without any challenges except for little cravings to eat something sweet, drink tea and chew something. Other than that there was no hunger. Swamiji then gave us a 3 day break before the next 11 days process. The 3 days was filled with eating our favorite foods again, this time filling up even though not much hunger was there which Gautama later realized, was a mistake. First few days of the next 11days went well. On the fourth day there was a huge overpowering craving to eat something. Gautama remembers walking into the kitchen about 5 times contemplating on whether to eat or not but every time Gautama asked himself if he is really hungry the answer would be no. At the end of that battle with his inner space , Gautama slept off that night. Next day woke up with no cravings and hunger and realized that the mind was playing tricks the day before in tricking Gautama to eat. The big click was how our lives are so much governed by the thought of food. Gautama knew this but realizing it was a whole new dimension. The whole body was resonating with this truth. Towards the end there was a moment when Gautama felt that he could actually live like this. The reality of living this lifestyle. This got strengthened when Gautama watched a breatharian couple on YouTube (http://www.youtube.com/watch?v=5p5ewQ9Z-7g) a couple who lived only by prana (through breath) for almost 4 years and even conceived a perfectly healthy child while being a breatharian. This was really encouraging see something in real life and what possibilities the body can do and how we are actually limiting ourselves to very mundane things like cravings and taste. How this whole thing could actually change the world. How this could raise the consciousness of the human race to a different level. We were told to start eating again as this was only a training stage and that the real bio memory can only be transferred when we were actually there with the master doing the process for 21 days. By this time Gautama’s weight had reduced from 68kg’s to 65kgs. Food intake after that reduced and lot of the old habits were starting to fade away. Some habits stayed. For example snacking in huge quantity would reduce to a smaller amount. There was more awareness while eating and over filling of the stomach completely stopped. Excessive fat in the body especially stomach reduced a lot and even after starting to eat again the weight stayed at the same level – which would have increased back to normal in a typical scenario of fasting. We (Gautama and wife) decided to take this one step further when we decided to do THE Samyama 21 days with Swamiji on the Dec 2012 cruise. We were told to do a complete extensive medical test before coming so we have a record to prove the benefits of the process. Gautama’s wife had decided that she would make this as her lifestyle after completing the 21days. The thought of taking this up as a lifestyle was almost like taking a big part of Gautama away from his life which was a big revelation to how much food ruled his life. Everything happened quite spontaneously, the decision of going for the cruise, doing the medical report and before you know it we were in Singapore boarding the ship. We were presented by the biggest challenge , being in an Italian Cruise ship with free flow of amazing food . To top it up there were Indian Chefs brought on the ship to cater for the other group of participants who were eating – catering beautiful Indian satvic food. Gautama can say with confidence, all the best food he could imagine was presented there on board. Despite all that Gautama was in such high determination experience the no food zone. This was the ultimate test. On the first day of THE Samyama during the break, there were Gautama’s favorite Samosas and spring rolls. All that high energy of the Samyama suddenly focused on to the food, the amazing aroma, the imagination of the taste and idea of eating it suddenly became very strong. Quickly Gautama started doing ajapa-japa and became really aware of the whole situation. Again he realized there was a huge craving of eating and tasting the food but no hunger and then Gautama realized that the craving was no more overpowering him. Gautama was really so happy with this. From that day onwards when there were food served, Gautama would look at all the food and just look inside and observe what was happening. There was lots of confidence to carry on after that throughout the days especially with all the other amazing processes we were going through with the master. All we had in the next 21 days was juice and soups . There were days when the ship went though turbulence and many of us felt sea sick. Many were advised to take the sea sick pills but Gautama refrained from taking any. There were 2 days where Gautama even vomited because of the sea sickness but that didn’t stop Gautama from continuing the process. During that time Gautama would just drink very little juice just to fill the stomach. One big thing that Gautama noticed is that many participants who were eating were having issues sleeping off during discussions and sessions but the ones on THE Samyama process were all alive and full of energy. In fact having a very light stomach was creating lots of awareness which intensified many other processes and meditation that Gautama went through. And the best of all, all the above is happening without any effort. Eating is no more related to attachment, necessity, to replace something, to fill some space and that’s gives such great freedom. The whole 21days process left a deep impact on Gautama and has given him lots of confidence that he has the capability of much more that what he thinks. Gautama initially started this only as an experiment to see if he could experience this no food space and is really glad he did this. Gautama knows for sure this is going to open up to many other possibilities and encourage Gautama to further experiment with life, to move to a higher state of consciousness. Gautama also knows for a very fact that none of these experiences would have had the slightest chance of happening without the encouragement, the grace, and the energy of the master. Only a master like Paramahamsa Nithyananda could have penetrated the thick logic mind and helped Gautama do this and what more with so much ease. My humblest gratitude to the master.